Detroit Mi Based – PLEASE READ TO SAVE YOU TIME AND MONEY!! Whether you have locs or not, we can come up with a solution to cover your bald spot while it grows back, or even if it doesn’t. With periodic maintenance along with a retwist or interlocking, you bald spot is no longer a problem. 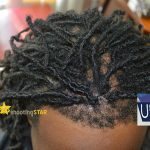 We use several techniques to attach locs in the balding area. If you have a few strands or none at all, we can find a way. Maintenance just involves tightening what is called a loc bridge down during retwists. See how you can finally remove the hat and be free today! In order to qualify for Bald Spot Coverage, one must already have Locs surrounding the area. We do not cover bald spots on natural unlocked hair. 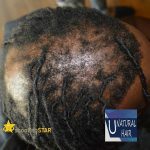 Bald Spot Coverage involves adding hair to bald areas on your scalp to duplicate your existing locs. We aim to make the bald spot area look like the locs you already have. We use human hair to simulate the look of your locs. This hair is a permanent or semi permanent installation. You can either receive a temporary bald spot coverage installation, if the hair is gonna grow back. Or you can try a more permanent solution to attach on to your bald spot area, if it won’t grow back. After Bald Spot Coverage has taken place, retightening must occur to keep the area tight and secure. Retightening occurs as frequently as a retwist. The bald spot coverage can last many months for temporary and years for permanent use. Retwists may be combined with the retightening of the bald spot coverage to achieve maximum results. Washing is allowed as long as very short strokes are used along the scalp to clean under the covered area. At your consultation, online or in person, we can determine base don a photo or in person, whether you are eligible for Bald Spot coverage. Sometimes it may not work depending on your specific needs.